Adobe isn’t really big about providing a user manual with their software. Fortunately, kind people offer tutorials on the web for it. Some are in the form of video on youtube, or for a monthly subscription, Lynda. Some are in the form of articles like psd tuts or Photoshop Tutorials. You can also find books on the subject. The textbook my class used was Photoshop Revealed (of course we used an older version). You can google for basic tutorials like “Photoshop Tutorials” or something specific you are looking for, like “Photoshop Bling Effect.” I do totally suggest frequently searching and playing with the tutorials. I learn something new almost every time, or I see an old tool used in such a unique way that it inspires me to come up with new ways to use it. I also am a huge fan of Microsoft One Note because of its ease to copy images online or do screen shots, and I keep my favorite tutorials saved in a Notebook there. I suggest something like that because it’s frustrating after doing the project once to later try to do it again and forget one tiny detail, and then you can’t find the tutorial you used to figure out where you are going wrong. At least bookmark it. When you click New, a box pops up with choices. You want to go RGB mode for most of your internet photos. CMYK for print. What it means? RGB is Red, Green, and Blue. These are colors designed for light to make white, like a computer or television screen. CMYK stands for Cyan, Magenta, Yellow, and Key (which is another word for black). These colors are designed for paper to make the white, in print. If you attempt to use RGB colors in print, most likely, you’ll get a slightly different color than you expected, especially if the paper isn’t a bright white. It also asks for dimensions with options for pixels or inches or other means to measure the graphic. The dimensions basically determine your width and height, but then it asks for pixels per inch (ppi), which tells how good quality the image will look. The more ppi, the longer it takes to load because its a bigger image and file, so it really depends on the project. Most print jobs are at 300 ppi, unless it’s a large print job, then they knock it down ppi to speed up upload times and save on their storage. On the computer, they like low ppi for faster loading. Most places adjust whatever you set your ppi to 72 ppi. The only way to preserve your ppi to send to someone else is email or google drive (hit the download button because right click and save will knock it down to 72). 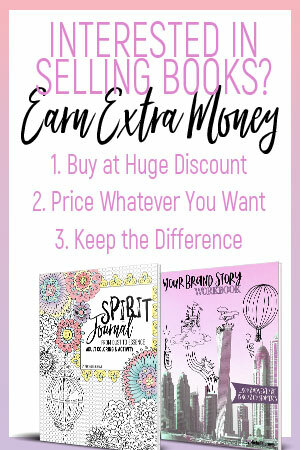 It gets confusing because you can have an awesome graphic in photoshop that blurs in print because your ppi was too low, but you can have a blurry photoshop graphic and it looks fabulous on the blog. Most favicons you see up on the top is actually very blurry that if you enlarge it to a Facebook sized image, you could barely figure out what it is. My standard ppi preference for print jobs is 300 ppi, and for computer screens, I do 150 ppi knowing the computer will knock it down to 72, but I want to maintain quality in my saved images in case I use them for something else. It also asks how you want your background, and I generally set mine to transparent (so that way you don’t get a white border square on an image you want to layer over something else). I keep the move tool as my default tool. It will only move what’s on the layer. You don’t have to “select” something to move. 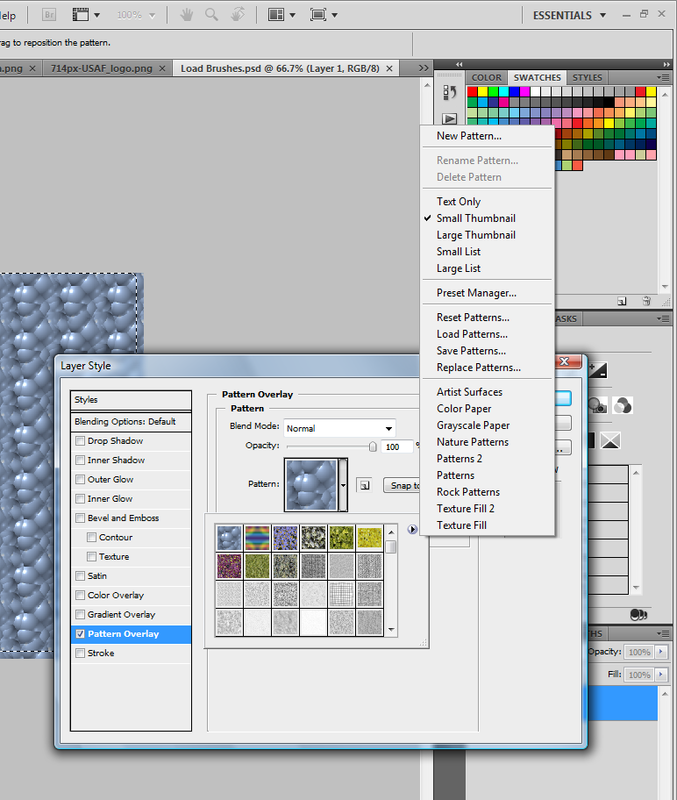 You can select multiple layers to move a bunch of things together (more on layers later). Of the other tools I use the most: Text, Brush, Paint Bucket, Gradient, and Shape. See how some of the tools have a picture of a little triangle on the bottom right? If you click on that tool and hold the clicker down for a second, a drop down list of options will appear. In my Photoshop, Gradient and Paintbucket are under the same tool where you change it back and forth with the little triangle. I sometimes use the magic wand selection. Let’s say you have a picture where the background is white, and you just want the image without that background on there. You can use the magic wand to select that white background only. You can also use the Magnetic Lasso Selection tool to select just the image or a portion of it, but it takes some skill to trace what you want to select. The zoom tool and hand tool, I’ll show you a better way to handle zooming and moving around the page later on. The Windows drop down menu has a lot of options as to what “windows” of tools and functions are available to display on your screen. 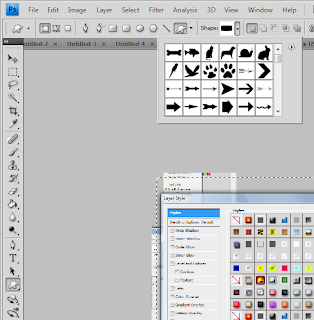 The ones I like to use the most, Tools, Layers (bottom right), Adjustments (middle right side) Navigator (top right on the left side), Swatches (top right on the right side), and Options (the top tool’s setting area). I also use the text and paragraph one. Check marking which ones you want to see will pop a window on your screen, like a little box, to do that thing. For instance, Navigator shows up as a little box to use the Navigator, but if you don’t want to use the Navigator, uncheck it, and it will disappear. Check it to make it reappear. You should play with some of these options to see what they are. If you can see two little arrows pointing to the right at the top of the bars, you can click those to almost like maximize the window of options and then again to almost like minimize it back down. See how the captain’s wheel is pushed in? Then that screen to the left pops up with a miniature version of your picture, and the red box shows what it’s showing of the screen. 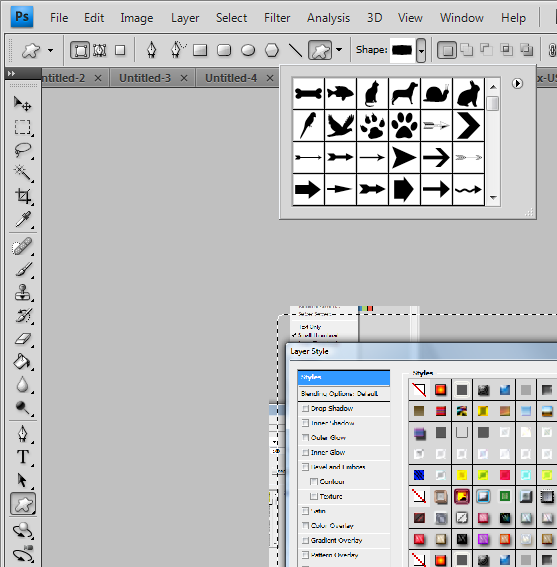 This is a screen shot of my Navigation Tool looking at the picture I saved above of the Photoshop screen, so remember that all the tools you see is part of the graphic I used. Bad example, I know. Sorry. Navigator is the easiest way to zoom in and out of the page and move around. It’s the thing that looks like a captain’s wheel. It’s got a red square: that is what is on your screen. You can zoom in and out with the little dial so to speak at the bottom, and the numbers to the right of it will tell you what percentage you are at. You can also click and move the little red square to move to that portion of the image. Now you can zoom in to tweak a detail all lazy like without having to click a button 20 times and scrolling for minutes to find that area you wanted to work on…. You want to open up the history window because in Photoshop, the undo button (control z) only goes back once. But with the history window, you can undo back way further than that. It just lists all the actions (to some specific point I don’t know) of what you’ve done. You can click on any action to be back at that action. You can also click on the top part to restore back to square one (blank if new, or original if opened an existing file). Shapes and brushes are easy ways to put some visual content on your picture. As for drawing shapes, they have the basics. The rectangle, the ellipse, the line… They also have custom shapes. If you choose custom shape, you can choose your shape on the top of the screen using the drop down arrow next to the shape. 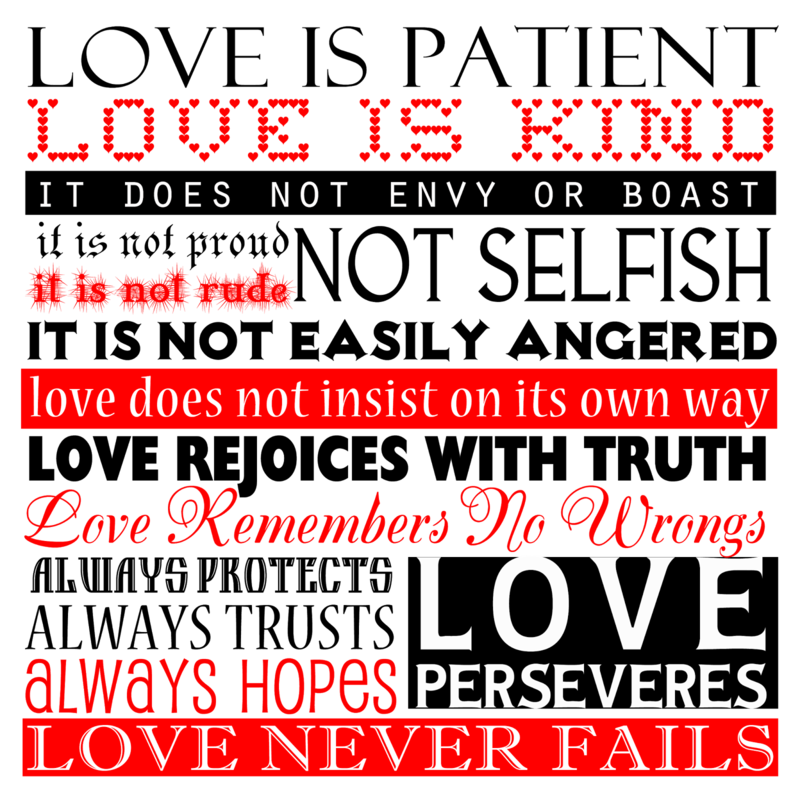 Photoshop has some nice ones saved in there, but you can also google and download some freebies people were so kind to create (read the license for use). That sun burst graphic concept you see a lot, a lot of those are available as a shape. Brushes operate the same way except the way it’s applied. With a shape, you click and drag to create a shape. 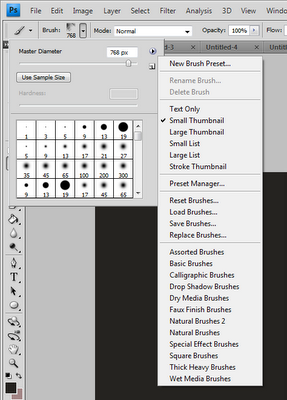 Brushes, you can click and drag to paint (for instance some brushes are available specifically for adding makeup to a face), and some are more designed to click in one area over and over again (up until desired thickness/opacity) to get an image (such as brush in the shape of a waterfall or grunge textures). BUT, you can always take whatever brush stroke you left on a layer (and remember this for other layers and things like text and shapes included) and then you can go to Edit dropdown menu and choose Free Transform to change the size. Brushes too are available online for download. More into that later. So let’s say you have a blank canvas, and you want to add a picture of the crazy chick smiling from a magazine ad in another file. I’m sure there’s a more complicated way of doing this, but open the picture of the crazy chick, drag it out by clicking the name of its tab above your projects and dragging down (ah you removed it from that world and made it free to float around your screen). Then make sure you are on the chick image (that it’s lit up and the tools are for that one and not the other picture), also make sure the arrow move tool is selected, and click the chick and drag her into your blank canvas. You can also do this with Adobe Illustrator: click and drag. I find it easier than copy and paste with Adobe products. If you want to put a picture from the internet into your photoshop, right click, choose copy image, and then paste it in photoshop. This doesn’t always work, but most of the time it does. Click the text tool, click on the canvas and start typing. You can go back an edit by choosing the type tool and clicking the text again. If you click the text tool and drag it out on the canvas in a box, you create an actual text box you can type into. As you are typing, in the options area toward the top, you can choose your font, size, color, and so forth. You can also re-size text by choosing edit in the drop down and free transform or any of the transform options (i.e. flip). If you click the text tool and hold down the clicker (because of the arrow), you can also have a vertical type tool. If you want to shape the text, the option for that is on the top of the screen. If you want to justify text, you need to have the paragraph window open (from the Windows Drop Down Menu) and you can highlight the text and choose the justification there, but beware. It will only fully justify a text box. You have to click and drag a box for that. If you use the Text Window, you can adjust size and spacing between text. 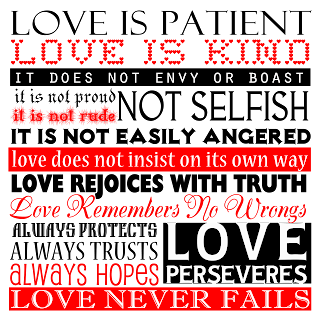 This is what we use to make all those neat text images like this one. The EDIT dropdown has your transform options. Free transform lets you use the drag and click options on the pic itself. Transform gives you a list of options for you to transform with a window of information (where you enter values and stuff like that for more precision like a 90 degree rotation). You can flip, rotate, resize, etc. in these options. Now in edit, the transform happens to the active layer (more on that later). If you want all the layers to rotate, you can do that under Image and then rotate, or select multiple layers. If you want to resize the image without losing proportion, hold in the Shift key when dragging. If you want to just move one of the corners of the square without moving the others, hit the CTRL key while dragging. There is a crop tool. I don’t use the one on the tool bar. To crop, I select what I want to keep with the rectangle selection tool, and then go to Image in the drop down and hit the crop option. That crops the ENTIRE image, not just one layer. This is what scared me from Photoshop for years. Layers were a tough thing to follow for something so awesome and simple. 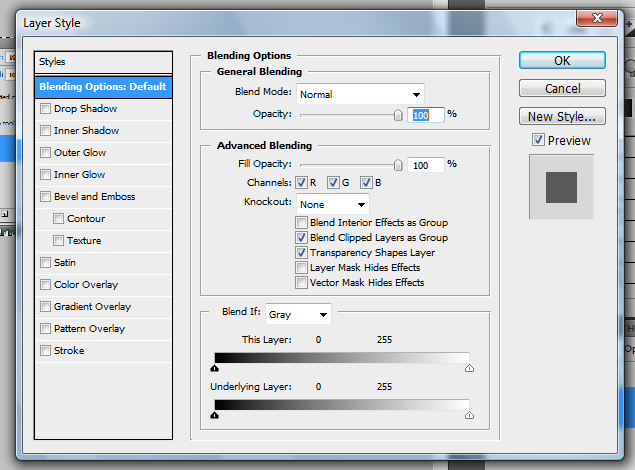 You’ll need the Layers Panel open from the Windows Dropdown for this. You know how in a simple graphic software, they have “Send to Back,” usually under the word “Arrange?” That’s what Layers do. It just makes it more visible and more editable. 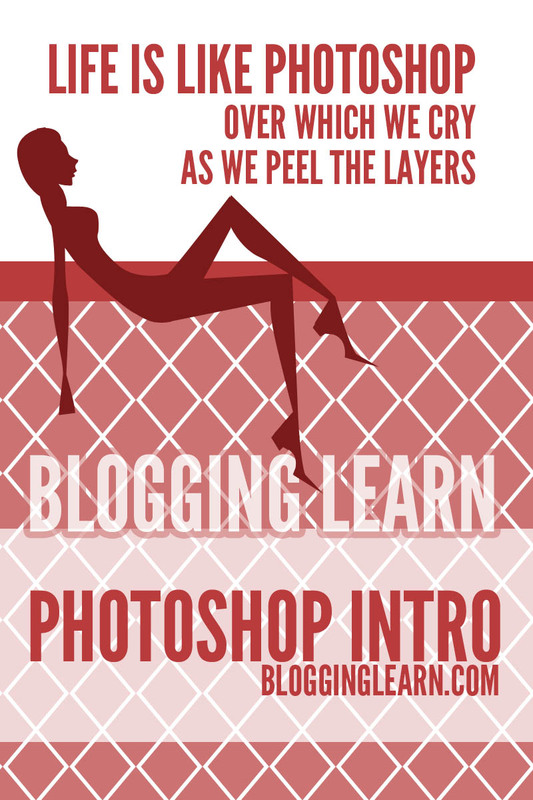 Photoshop Layers operate like layers of tracing paper on top of each other. 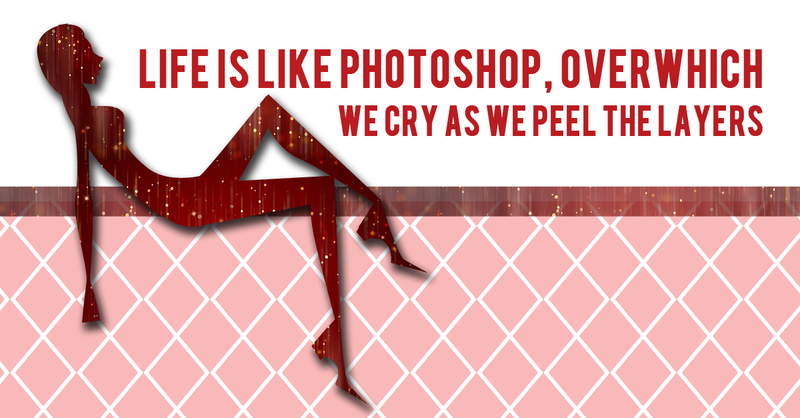 With Photoshop, you build layers of work. 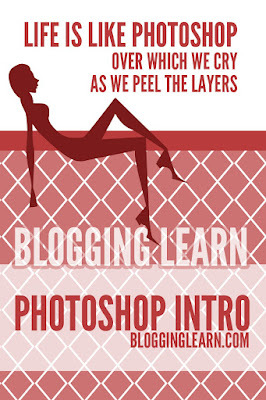 Like you can put the face of a woman as one layer, the background color as another layer, and the text as another layer. You can add eye make up in one layer, or smooth out her wrinkles on another layer. You can decide the order these items are going to go, how they overlap each other (click the layer and drag it above or below other layers). You can change the opacity of one layer (make it somewhat see through-click the layer in the layers panel and opacity is in the upper right hand portion of the panel). You can turn off a layer where it doesn’t show up in the picture so you can work without some image in your way but not having to delete the image itself just yet (click the eye ball on the left of the layer in the layer’s panel). 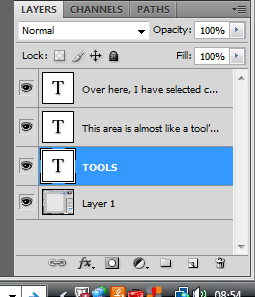 To create a new layer, go to the Layers tool area/tab, and click on the little square with a square in it (to the left of the trash can), and that just instantly creates a new layer. To copy a layer, getting the exact same thing you have on the layer to show up twice, just drag the layer you want to copy into the new layer option. Dragging a layer to the trash can deletes it. 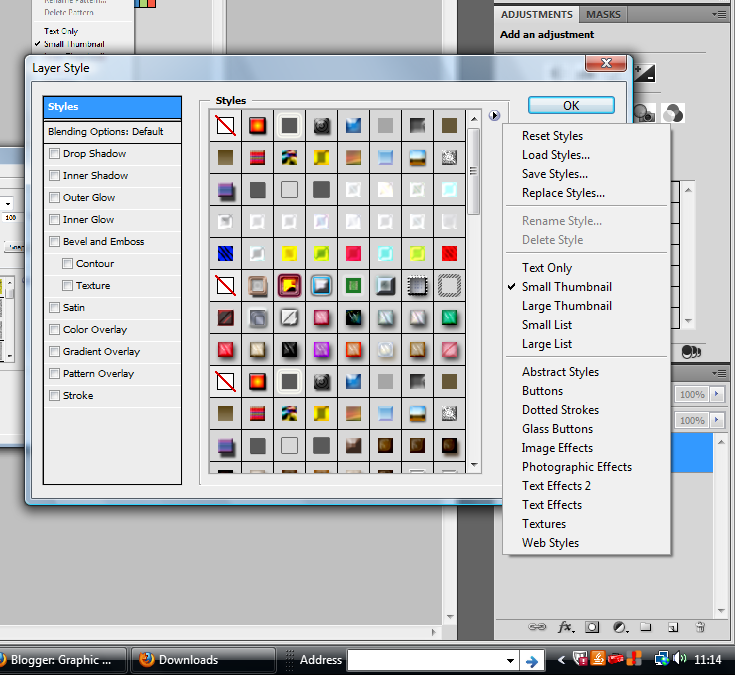 You can also name your layers by double clicking the text like you would to rename a file. If you look at the image here,there are 4 layers. Each text is a layer, and layer 1 includes my little print screen of Photoshop. To work on a specific layer, just click the layer to highlight it, and that’s the layer you are on. With mine, with text, you can have the text tool on and click any text and if you hit it right, photoshop automatically moves to that layer. But pay attention because it gets really confusing quick if you start editing the wrong layer, especially if you are new to Photoshop and layers. You can link layers by selecting more than one (like you would pictures, hitting control button as you click to choose multiple layers, or shift to get the series) and then hitting that little chain link pictures at the bottom left. You can also group them using that folder to create a new group. I tend to link things where like if I make a logo that has 5 circles on top of each other each edited slightly different with different opacity, I’ll link those so every time I move that thing, all of it moves together. I tend to group layers when I’m working with a bunch of layers on a project, and I just want them organized. 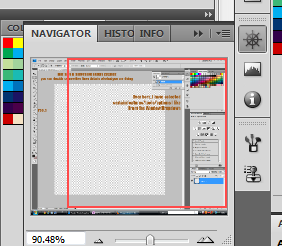 If you hit that little lock button, it will lock your layer so you can’t mess up that layer. A lot of times, if you open a picture you downloaded from Google’s images, it’s going to be one layer, and that layer often is locked as background. Sometimes Photoshop locks the background when you create a new file. Just double click it and name it (layer 0 counts), and that will unlock it so you can do stuff like select something or erase something. Which brings me to styles… Double click a layer and you get a really awesome cool box (my favorite toy in Photoshop). This is where you can play for hours on something. If you have text on a layer, this will change how the text looks. If you draw a shape, have a photograph, did a brush stroke, whatever, it will change only what is on the layer. Keep in mind, every time you click anything on the left, the options on the right change, but you have to click the text to highlight it to tweak those options as well (as opposed to just the checkmark). The Styles above the highlighted area on the left show a list of saved styles you have. Styles are basically a mixture of the options below the highlighted area that provide a desired effect, like metal or water. Photoshop comes with some default styles, and you can make some (click new style), or download some (pay attention to license agreements). Keep in mind the styles will change what it does to your image based on the size. Some styles are designed for larger images and others for smaller. Some are designed for text and others for boxes. You can use any style on anything, but you won’t always get the desired effect. I notice this the most with the metal styles. But if you click the “Preview” option on the right like I did, every time you click a style, you can look over at your work and see how it changes. If you don’t like it, click the next one… You can always hit cancel and no change will happen to your work. The options below are things you can adjust (with or without a style). In each, you can change some of the settings too like make your drop shadow go deeper or your glow bigger. You can change the color of the glow. Just know that with the overlays, if you have a color overlay and a gradient chosen, you will have to change the opacity to the color in order to see the gradient. Same deal with Pattern Overlays too. It layers those options, so you can do one or the other at 100% opacity, or you can lighten the opacity to a color or gradient so the pattern appears. You can also change the opacity of the pattern if you want the text color to show through that pattern overlay. If you are into scrapbooking, pattern overlay and the Bevel Emboss Texture are going to be two of your favorites I’m sure. There’s so much more you can do with layers like a layer mask that I’m not going to get into now, but just know they exist and it’s something you will want to learn down the road. Also know that you can flatten your layers which combines all the VISIBLE ones into one layer (knocking out all the ones you removed visibility from). Your best bet for right now is to save the image as a photoshop file with all your layers (do not flatten them). That way, if you want to come back and tweak a layer or something, you have those layers in tact. Then you go back and SAVE AS a png or jpg, and that will flatten it for that image, but you still have your photoshop version of the image with your layers available. This is important because let’s say you are working on your blog’s logo masthead thing, and you don’t save the layers and later you want just one portion of that masthead to be your logo for something else, or you want to change the background or text of your masthead, or you join some group where you want to tweak portions of your blog’s masthead into the profile pic of a different specified size… Without the layers in tact, it’s all flat. You’ll have to lasso each element (which is no where near the awesome quality you had before flattening) or start over. One, you can google them. Lots of sites and people offer free downloads no different than fonts. Like fonts, make sure to read their license agreement. They usually download as a zip file. You’ll have to go in and extract the data by finding where it downloaded. Right click the file, and choose the option to extract data. Remember where you extracted that data. Then in Photoshop, you will have to “load” the data. 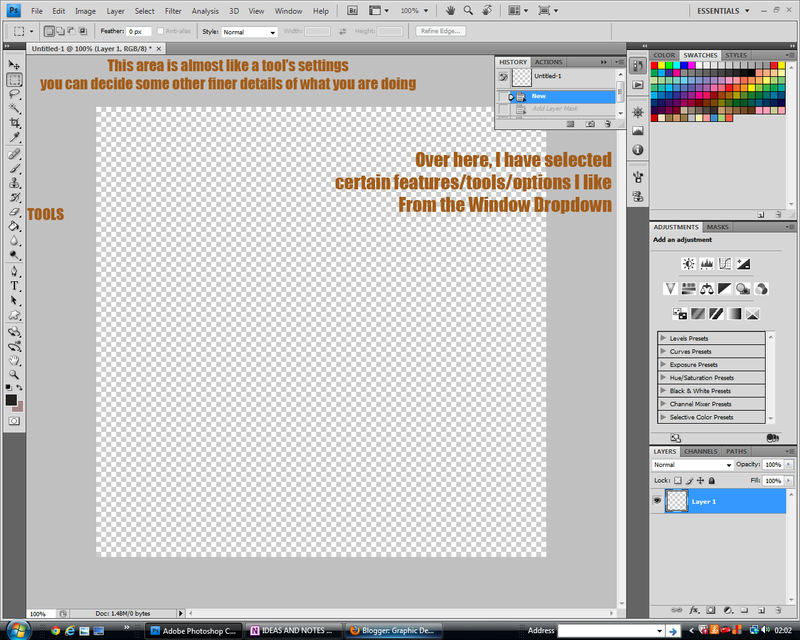 Click the brush on the tools option, or show the brushes panel under the Window Drop Down. Either way, in both cases, anywhere you can choose your brush, in the top right, there’s a little arrow with a circle around it. Click that. Now you have a list of options like in the picture here. Choose Load Brushes option. A file window should pop up to browse your computer. Go to where you extracted files. You will probably have to enter the folder and get to the exact brush file, click that and you should be set. Just note, if you load too many brushes at once, your Photoshop Brush will run slower. Also note, if you close out of photoshop regular like, it generally saves what you loaded. At some point, you may have to re-load, so it helps to keep the files somewhere easy to find in the future. I go to where you can put a pattern overlay in styles (from the Layers area), and you drop down to select your pattern, and there’s another little arrow with a circle around it. Click that. Choose to Load Patterns. 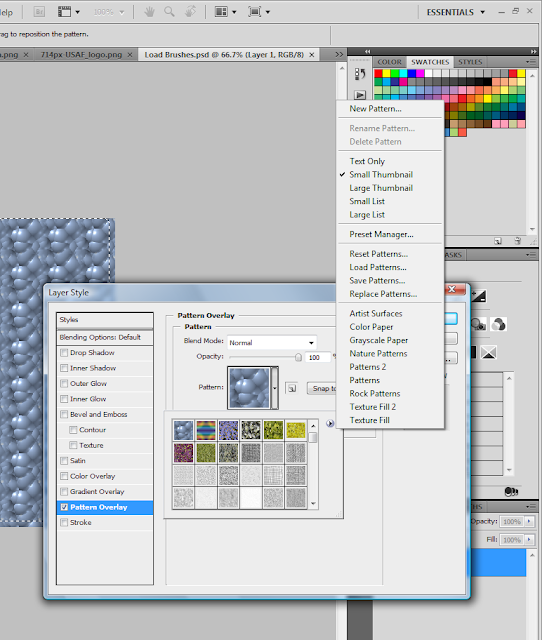 Then find where you extracted any of your patterns or textures. Choose the custom shape tool on the left, under options (remember to have that selected under the Windows drop down), go to the area where you can select your shape, hit that drop arrow, and see the little arrow with the circle around it on the right? You know what to do by now. Click it and choose Load Shapes. After you make your elements and save them, you will want to go Edit. Preset Manager. And then find what you made by choosing the correct Preset Type. Click on it (to select more than one, hit the CTRL button while you click), and then Save Set. Choose where to save it. It will not save for the next opening of Photoshop unless you do this step. The image has to be less than 2500 pixels either direction. For a pattern, same thing. Get it opened in photoshop, and then choose Edit from the drop down list, and choose Define Pattern. Some patterns, you design for tiling where you can use an X in a square to make a diamond effect. Some patterns, people use them without the intent to tile them, like textures like the photograph of some glitter. 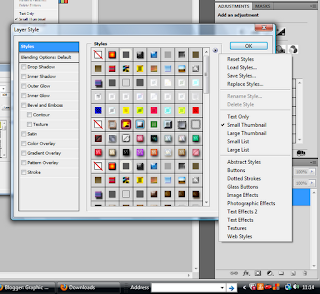 For a style, go to your layer, double click it to get your layer styles up. Make your style with a combination of the effects you can do. Once you have it to a style you want to have pre-set in your styles, click “New Style” and save it. This is not only a good idea when you create a work of art, like a metallic look, but it’s also good if you adjust the numbers at all and plan to use it for different elements on the same graphic, like a deeper drop shadow or a specific glow that you want on every layer. It’s just faster to save it as a style than to manually enter numbers you had to memorize. For a shape, it’s a similar deal to a pattern or brush, but you are dealing with black and white, no gray or other colors. You also have to use the Pen Tool to create a path. Brushes and patterns can be created with the IMAGE that’s there, but the shapes, they need a PATH. You can choose the pen tool and just draw a shape. It’s not like freehand. You click and create an anchor point, and then another one, and then another one. If you hold down the clicker as you create an anchor point, you can also create curves and adjust the curves. It takes some work getting used to it, but the better shapes all have some curve to them. You can also edit the path with the options of the pen tool by clicking the pen tool and holding in the clicker for a second to get the other tools like delete a point. With this in mind, you can use a regular photoshop shape and adjust it with that pen tool turning an ellipse into a tear drop by removing some anchors. You can also take a black and white image, create a new layer, and trace the image with the pen tool. For more detailed information on how to work with creating paths for purposes of making shapes, read this tutorial on creating custom shapes. Either way, once you get your path created, then go to the Edit drop down menu and choose Define Custom Shape. Some of the things you can do also requires a plug in. There was something in one of my textbooks I loved that I can’t get the plugin to work on mine, but the plug ins are generally available on Adobe’s website, some free of charge, and many others have designed plug ins you can purchase (some are free). I think that’s the basic rundown of Photoshop. I deeply hope it makes sense to other people besides myself, and I hope it’s useful. Again, check out the many MANY tutorials on the web and the more you use it, the more creative you are going to get with the tools. Practice makes perfect.